This is an account of my first independent trip outside the country. I am sure it will inspire you to visit Bhutan and plan a perfect Bhutan itinerary for 5 days. 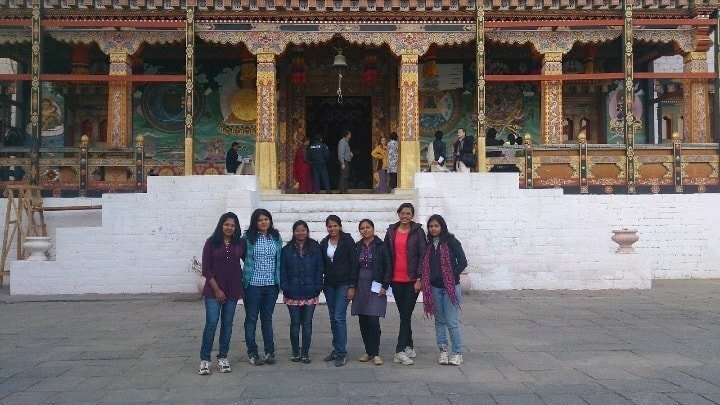 I knew that this all-girls trip to Bhutan would be memorable for more than just one reason. My first adventure in the Himalayas, my first tour with friends and the first stamp on my passport. Well, the last one didn’t happen because for Indian nationals passport is not stamped when you visit Bhutan. A place where every building has a story to tell, where serenity prevails even in the busiest traffic, where strangers greet like they’ve known each other for ages and man lives in complete harmony with nature despite the progress in technology. That, in a nutshell, is Bhutan for you. During my 5 days in Bhutan, I was moved by some intricate details beyond the natural view, architecture, and adventure. On our 8-hour journey from the border town Phuentsholing to Paro, we could not hear any honking. Coming from India, to the closest neighbor, this was a culture shock. Another impressive thing was how rooted they are to their culture while being progressive at the same time. This trip to Bhutan seemed like a time travel to the period that our parents often talk about. When people were much closer to the nature around them. The time when kids played on the streets without their parents being fussy and overprotective. Bhutan seems to live at that time when people were less worried about the future and enjoyed the present. For the old-world dreamer that I am, the tour was really the much-needed break from the modern mundane life of ours. Did you know Bhutan is the only carbon-negative country in the world? 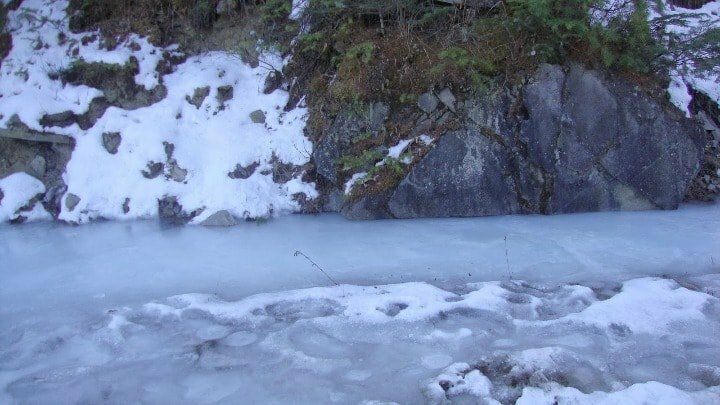 Which means this tiny land-locked Himalayan country absorbs more CO2 than it produces!! If we aid them with money, let’s not be too proud of it because Bhutan aids the world with Oxygen. It was a surprisingly warm day for February when we reached Hasimara at 1 p.m. After immigration formalities and lunch at Jaigaon, we set off for our 8-hour long journey to Paro. 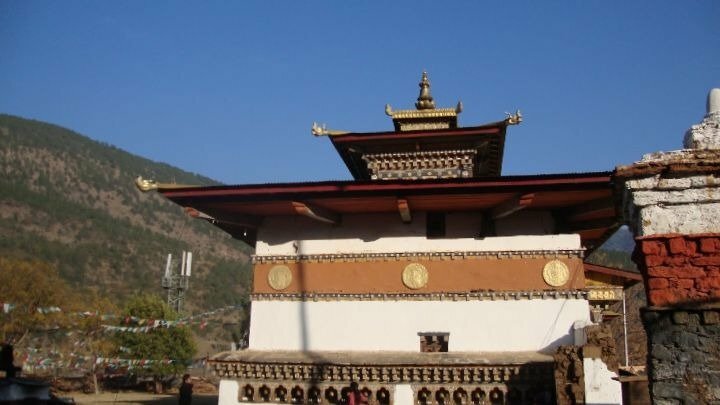 It is a beautiful town in the Paro valley that is home to hundreds of legends from the Bhutanese history. We were not aware of then was that it was a special day in the Bhutanese calendar. According to their tradition was the Day of Offering, similar to the Thanksgiving day of the US and Canada. We were welcomed with a warm reception given by the proprietor of our hotel. He told us about this day which is celebrated as Buelwa Phuewi Nyim – the Traditional Day of Offering. Planning a trip to Bhutan? Save this post for later by pinning the image below! We were late by an hour on our first day of sightseeing and we set off for Chele la Pass, which at 3988m elevation is the highest point on the famous Dantak road. It was a 2-hour uphill drive to this point. It’s a path with densely covered forests on both sides and the view of the snow-covered Himalayas. 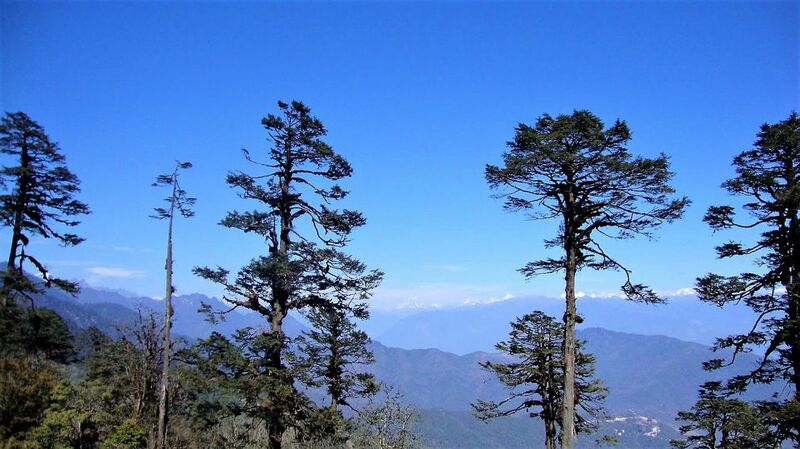 The highest point is marked with the trademark Tibetian flags and colorful rhododendrons that shine under the bright sun. We found patches of snow-covered areas glittering in the sunlight on our way, however the place itself was warm and sunny, and to our little disappointment, devoid of snow. 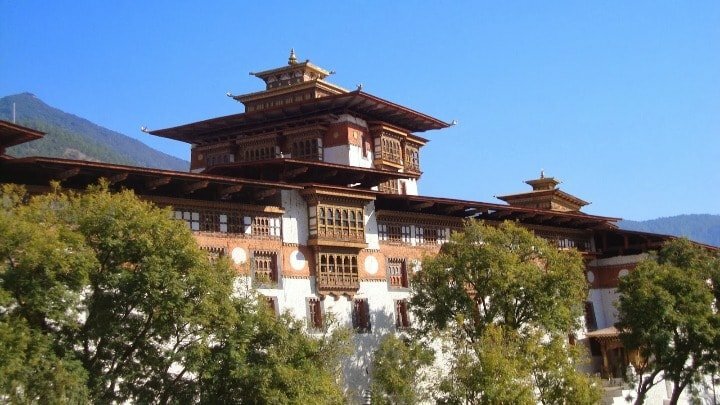 We spent a great time there enjoying tea and making futile attempts of capturing the spotless beauty of nature in our high-resolution cameras, after which we set off for our next destination, the Rinpung Dzong – the ancient court of justice and administrative building of Bhutan. At this point, I would like to pause and put a note on Dzongs. Loosely translated as “fortresses”, the Dzong architecture is typical to the Buddhist kingdoms of the Himalayas. The Rinpung Dzong was built in the early 17th century on the foundations of a 10th-century monastery. It consists of the office of the Dzongda (the district administrative head) and the judiciary court of Paro. People should wear full sleeved outfits and remove any kind of scarf off their head before entering the Dzong. We then visited Ta Dzong– the national museum of Bhutan situated on the hill above the Rinpung Dzong. It was built as a watchtower during the wars of the 17th century to defend the Rinpung Dzong. The place took us on a memorable journey through the history of Bhutan, its rich cultural and faunal diversity. Outside the gate of the Dzong, we met a little Bhutanese girl who couldn’t understand a single word that we spoke but stuck around us while we posed for photographs. Our last destination for the day was the Kyichu Lhakhang monastery, one of the oldest shrines of Bhutan built in the 7th century. This holy place is famous for a pair of evergreen orange trees that bear fruits throughout the year. Here comes the day that we were most excited about. 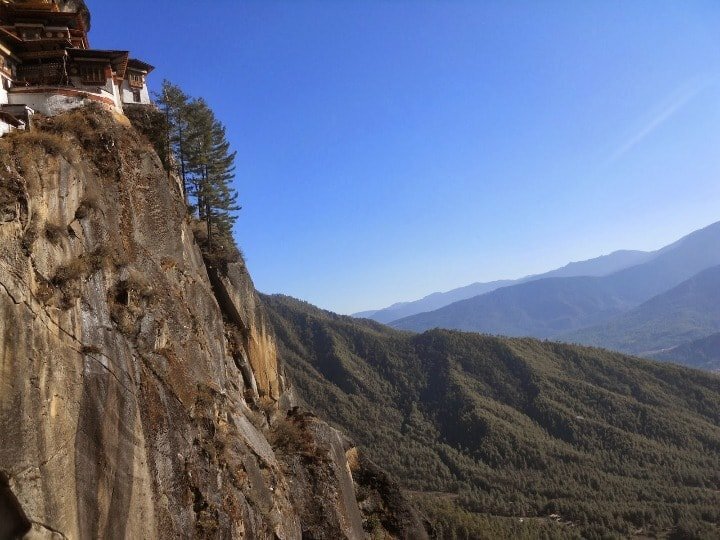 A 3-hour hike to the famous Taktshang Lhakhang, more commonly known as the tiger’s nest. It is one of the most sacred sites for Buddhists all over the world. Perched atop the cliff 900m above the floor of the Paro valley overlooking the Paro river, trek to the Tigers’ nest was a rough thrilling path inlaid with thick vegetation all around. It was my first Himalayan trek. I was zealously climbing the rocks despite not being in my best health. 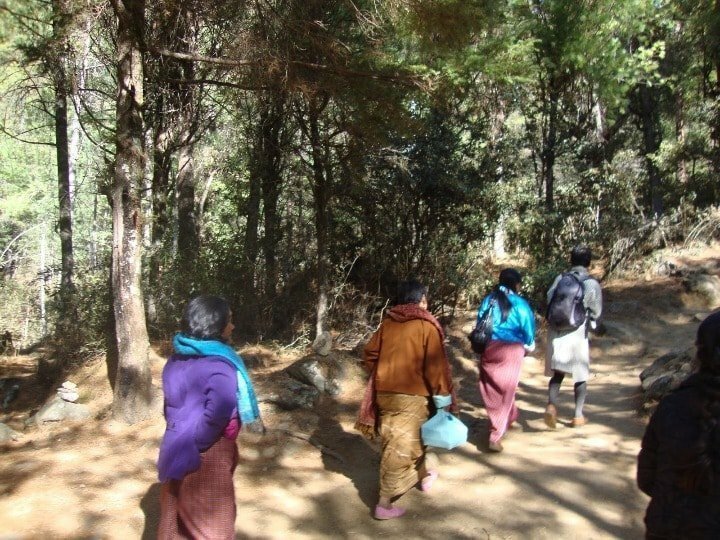 On the way, there is a small Lakhang (a small village level monastery) and a temple. This is a viewpoint from where the copper-colored rocky mountain looks like the face of a demon. One of the locals we met during the trek told us about this. There is a cafeteria on the path below this viewpoint for tourists and travelers to relax a bit. Crossing a few more hurdles and difficult terrains on the way we finally reached the place to find out that the monastery was closed for lunchtime. However, the waiting time in the monastery came as a blessing in disguise. It allowed us to enjoy the chilly breeze in the warm sunny day, amidst the sound of waterfall and chirping of birds all around. We spent our time chewing on snacks and chatting among ourselves as well as with the other travelers from different parts of the world. Some of them visited for religion while some simply for the joy of trekking. Once again I was touched by the warm, jovial nature of the Bhutanese. 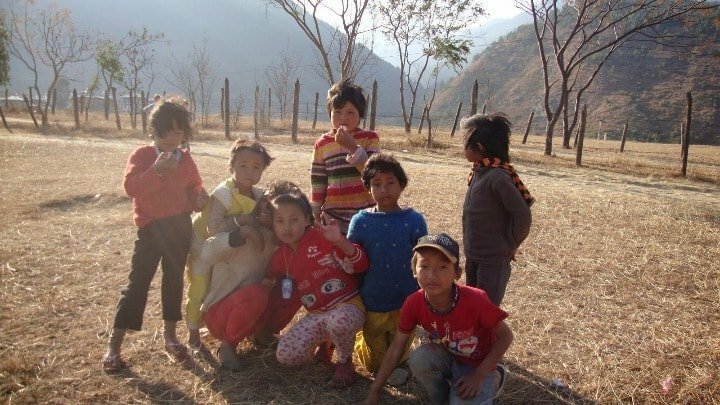 They climbed the hills like it was a cakewalk and offered help to others in every possible way. The monastery comprised of eight temples each of which housed hundreds of mystical stories. Legends hold that Guru Rinpoche arrived here from Tibet on a tigress in the 8th century. He meditated in the caves for three years, three months, three weeks, three days and three hours. The monastery was first built in 1692 around those 13 caves but was destroyed in fire twice. The reconstruction was completed in 2005. One of the disciples in the monastery spoke to us about the various legends associated with the place and took us to each of the temples. We were awestruck at the architecture and the stories encompassing the mystical caves. The thrill and wonder of this amazing place made me forget the pain in my ankles and we returned with our hearts filled with awe at the mystery of the land. Read more about Tiger’s Nest Trek. 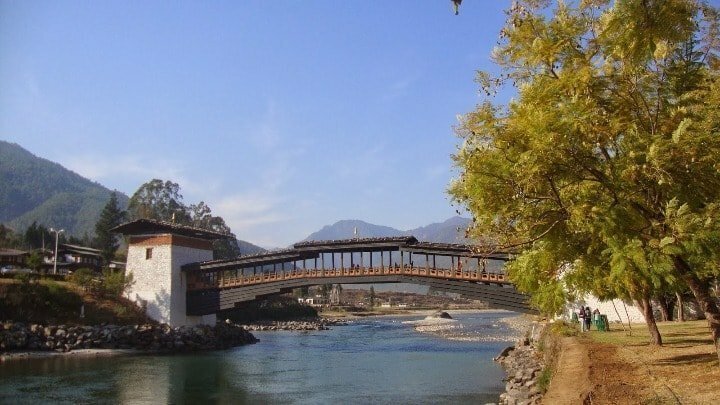 Punakha, the former capital and still the winter capital of Bhutan are endowed with warm temporal climate. 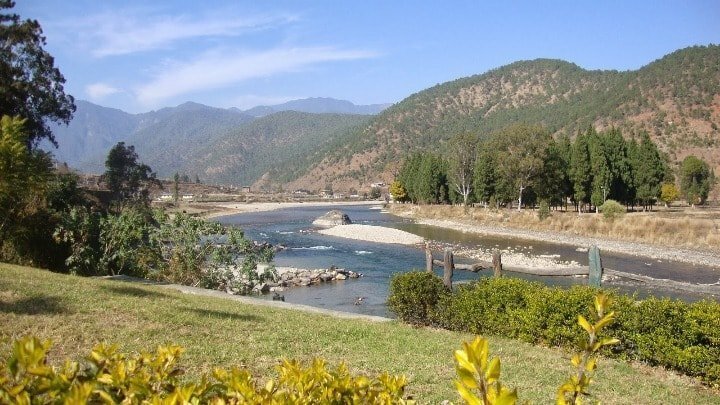 Punakha valley is the abode of the richest soil in Bhutan owing to the natural drainage from two main rivers, Pho-chu(father river) and Mo-chu (mother river). We started off early in the morning at 7 a.m from Paro towards the capital city Thimphu, where we needed to get the permits. For this first time in the three days, we found ourselves in a usual urban atmosphere. There were marketplaces, lots of restaurants, cafes and even shopping malls. While our driver went off to take the permits, we went to the textile museum on the other side of the road. The museum was built in 2001 by the Mother Queen, with the objective of sustaining Bhutan’s traditional textile art. We watched an interesting AV that described the different styles of outfits and accessories worn by people in different regions of Bhutan. We also learned about the unique way in which the textiles are woven and how to wear the traditional Bhutanese dress. The museum is divided into 6 parts- Achievements in Textile Arts, the role of textiles in religion, textiles from indigenous fibers, The Royal Collection, warp pattern weaves, and weft pattern weaves. We then drove our way to the enthralling Dochula Pass, the famous pass between Thimpu and Punakha that gives a 360-degree panoramic view of the Himalayan Range. 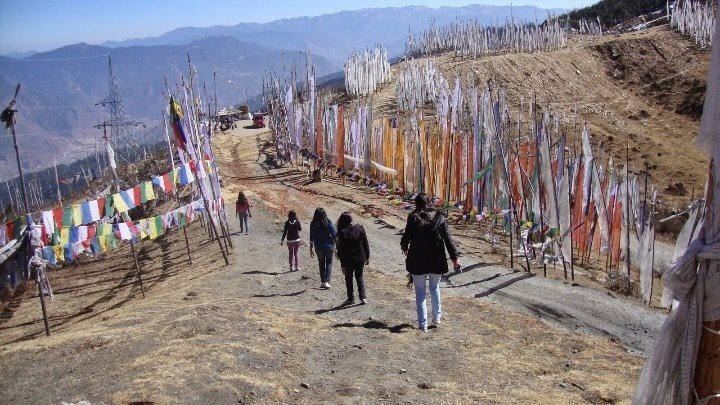 The pass is decked by 108 chortens known as Druk Wangyal Chortens built opposite to the temple Druk Wangyal Lhakhang. The snow-covered Himalayan mountains provide the perfect backdrop to this picturesque location. Our next stop was the Punakha Dzong, the second largest and second oldest Dzong of Bhutan built at the confluence of Pho-chu and Mo-chu rivers on the Punakha- Wangdue Valley. This majestic building stood the test of time and was rebuilt and restored its past grandeur by the present King, after being destroyed four times in the past due to fire and earthquake. This is the Dzong where the royal wedding of the present King of Bhutan took place in 2011. We were standing before a temple inside the Dzong listening to the mystical chants when all of a sudden we heard the cries of some monks and found some of them rushing out of the temple with canes in their hand hitting hard on the grounds. For a moment we were stunned and fled like a bunch of terrified kids. But soon we discovered that it was a part of an annual ritual that is performed at this Dzong, and felt lucky to have witnessed it. Our last destination for the day was Chimi Lhakhang– the fertility temple located on a hilltop in the farmlands of Punakha. It is believed that couples who don’t have children get their wishes fulfilled when they worship at this temple. We reached the temple through the dusty road with lush green fields on both sides. The evening puja was going on, and an occult ambiance was created inside the temple. A guide was depicting the various legends associated with this temple. It was about how a demoness camouflaged to fool the Lama Kunley but was ultimately identified and subdued. 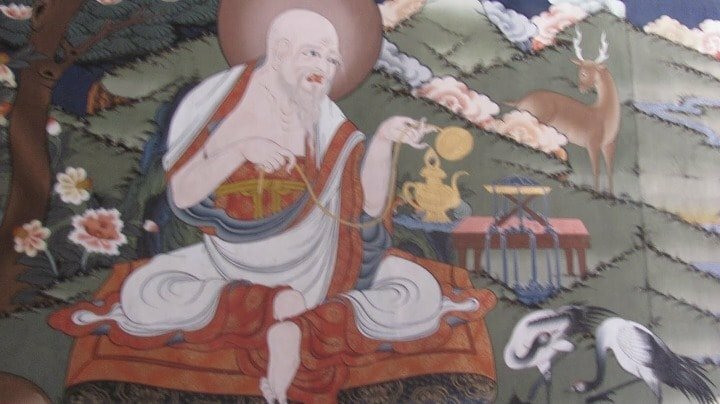 Lama Drukpa Kunley was a monk who preached Buddhist philosophy in form of simple tales and was known as the “Divine Madman” for his unconventional ways- a personality that we can very easily relate to the Indian Hindu saint Sri Rama Krishna. The temple is decked with frescos and statues depicting the legends associated with it. Outside the temple were two Shivlings, a huge Peepal tree and colorful flags fluttering in the pleasant breeze. The mountains far away shimmered like gold during the twilight as we made our way downhill back to the cab. We stayed overnight at a small hotel at Wangdue. Our last day at Bhutan was dedicated to the capital, Thimphu that exhibits a unique juxtaposition of modern developments with the ancient traditions. Born in the lap of the Wang-Chuu valley, Thimphu is the abode of the historically and politically important buildings. It is the center of economic and government activities of Bhutan. We started off from our hotel at Wangdue at 8.00a.m. and drove through the scenic Dochula pass to reach the Thimphu valley. Our first destination for the day was the National Memorial Chorten. 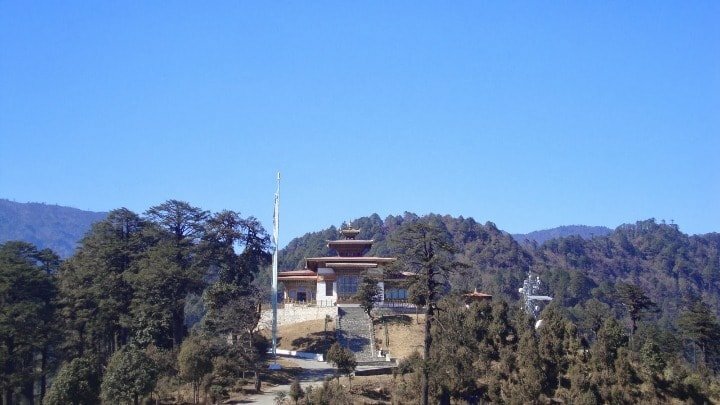 It was built in 1974 by the then Queen in memory of her royal son, who is popularly accepted as the Father of modern Bhutan. 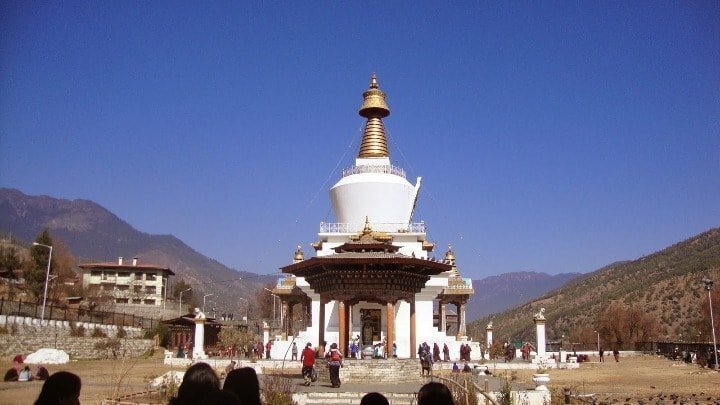 Also known as the Thimphu Chorten, it is considered to be the “most visible religious landmark of Bhutan”. The frescos and statues inside which gives an insight into the Buddhist philosophy. We visited the Changankha Lhakhang, a fortress-like temple standing high amidst the ruins of its past splendor, where young children in Bhutan are named. Established in the 12th century, the temple houses a splendid statue of Chenrezig with 11 heads, a group of three large prayer wheels and rare scriptures. The courtyard of the temple provides an amazing bird’s eye view of the Thimpu valley. 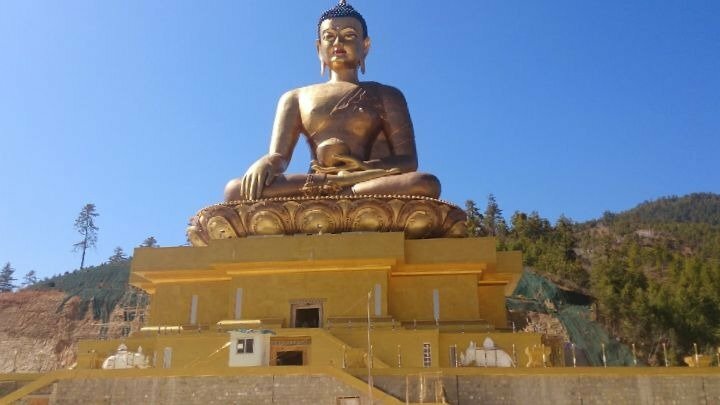 We then reached the Buddha Point, a place at an elevation of 300 ft above the Wang-chu river bed where stands the grand bronze statue of Gautam Buddha under construction, known as Buddha Drodenma. The 169 ft statue was going to be the tallest statue of Buddha and was envisioned to become the probable eighth wonder of the world. Overlooking the capital town Thimpu, this temple will have 1,00,000 8-inch idols and 25,000 12-inch idols of Buddha inside. We were spellbound at the view of the city from the courtyard of the temple. Later, from our hotel far away from the Buddha point, we could still see the majestic spiritual statue. 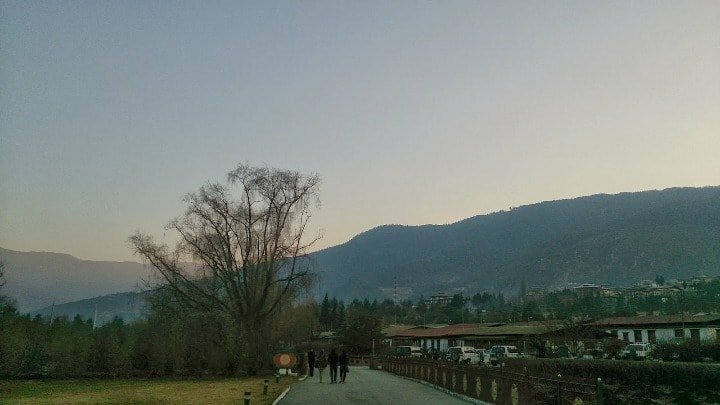 On our way to the Takin preserve, we caught a glimpse of the one of the most important Dzong of Bhutan, the Thimphu Dzong which has served as the seat of Bhutan’s government since 1952. The pompous beauty of the Dzong thrilled us, but we came to know that the Dzong is open to visitors of for 1 hour from 4 pm to 5 pm, after the flag is pulled down ceremoniously. so we went past the Dzong and arrived at the Motithang Takin preserve that is a safe abode of the national animal of Bhutan classified under “vulnerable” species. It is the largest and sturdiest goat antelope in the world that can be found only in and around Bhutan. Takin was declared the national animal of Bhutan in 2005. This place was originally a mini-zoo but was converted into a reserve where the animals could roam about freely. The rare animal was seen living in harmony with other herbivores in the open space of the reserve. From here we headed to the Folk Heritage Museum. It has exhibits of ancient Bhutanese artifacts, domestic equipment and documentation of the rural lifestyle. We walked inside the 3-storeyed rural Bhutanese house, wherein each of the stories is dedicated to a specific household activity. The stairs to the upper stories are unusually steep, probably to save the ground space. The museum is dedicated to providing a sustainable life to the underprivileged through the revenues earned from entry fees. Near the museum, there was the Institute of Zorig Chusum, the art & crafts school which we saw on our way to the National Library. Here you can find some rare exhibits of Indian Pattachitra art depicting Hindu Mythology. There are printing blocks for prayer flags and ancient Buddhist manuscripts dating back to centuries alongside modern academic books. After this, we headed to the city where we revelled on Indian and Tibetian delicacies and explored local marked till 4 pm. This is the time at which the Thimpu Dzong is opened for visitors to see the daily closing ceremony. To our disappointment, we were late for the ceremony by the time we reached. However, the Dzong was still open so we could still check out the paintings and intricate sculptures in the interiors. 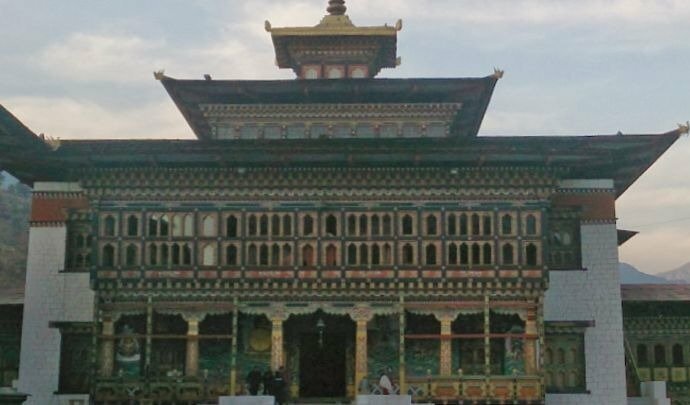 This being the center of political affairs in Bhutan was under strict security and visitors are restricted entry to many parts of the building. We could catch a glimpse of the golden palace of the King peeping beyond the thick forests. The joyous dance of colors in the sky during the sunset made up for the closing ceremony that we missed out. Thus we completed our tour for the day and returned to our hotel at Thimphu. I slept with a lingering note of melancholy as the memorable trip to Bhutan came to an end. So this was officially our last day in Bhutan. We packed our belongings and set off for our last drive through the Himalayan country. As we made our way to Hasimara, our heart was full of gratitude for the people of Bhutan. Etched in our minds were the priceless memories to be cherished for a long time ahead. Special thanks to Himalayan Travels for planning everything for us – the itinerary, hotels, all permits, and car. Hope you liked this travel story. Subscribe to Backpack & Explore, to never miss a weekly update from Backpack & Explore. Share if you liked the post to show your support of my endeavor. I've wanted to visit Bhutan ever since I learned that the country measures 'Gross National Happiness' instead of GDP. Love this article! Sounds like you had a fascinating time. Personally I would love to visit the Folk Heritage Museum, and it's great to hear that they invest their revenue into supporting underprivileged people. A highly educational read – thank you! I've wanted to go to Bhutan for a long time and your writing really brings it to life. The Paro Valley looks stunning and of course the famous Tiger's Nest would be such a fantastic sight to see. Looks like your first travel experience was a great success. 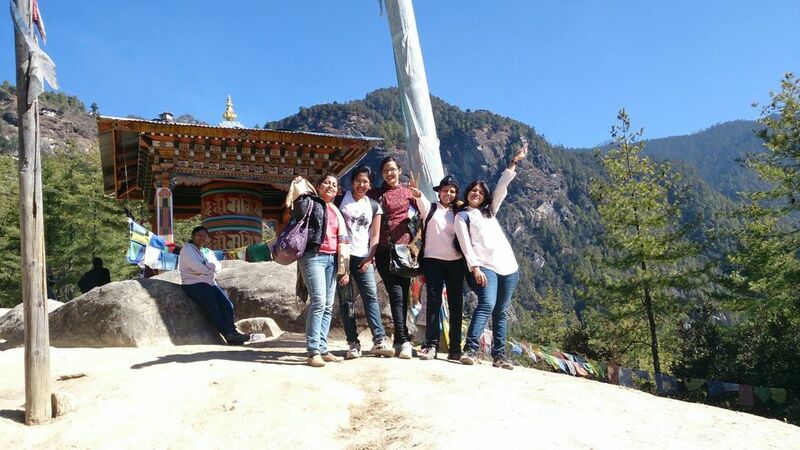 An all girls trip to Bhutan sounds just awesome! Bhutan is so beautiful. We were there for a very short time and would want to go back for sure. Just loved the virtual tour to the country through this post. Tiger's Nest , perched at top of the mountains is definitely high on my list! I always wanted to visit Bhutan and loved that it is a land of joy. It is really a mystic place. Great to know that this country is carbon-negative in whole world and I can now imagine, how pure is the air must be there. You have taken stunning shot of bridge over the Paro river. Wow! I have never been to Bhutan but I'd love to visit it one day. There's a ton of lovely picturesque views to see. What a great place for trekking! Good to know that you enjoy your travel here. That's such a cool all girls trip. I too wish to visit such beautiful countries like bhutan with such a cool team. Well, I have been planning a trip to Bhutan since long, but never got a chance. It's great to know the fact that Bhutan is the only carbon-negative country. The Dochula Pass and Paro river are very scenic places. I hope I am soon able to make it there. Thanks for all the wonderful tips and information. Some my favorite trips have been with girlfriends and this one looks like a beautiful one too. I hoe you guys have memories to fall back on for years. Wow what an informative post about a place on my bucket list. I love the mountains and this is perfect for me The 8 hrs travel is a bit to much once you land but I’m sure you can fly to Faro as well. It’s one of the greenest destinations and the food is another aspect The folk heritage museum looks interesting and a place you can gain knowledge about the history. Thanks for sharing. I would love to do the exact trip. I really enjoyed your photos, thanks for sharing, A 3 hour hike to the Tigers Nest would be a highlight as well as seeing the colourful flags at Chele la. 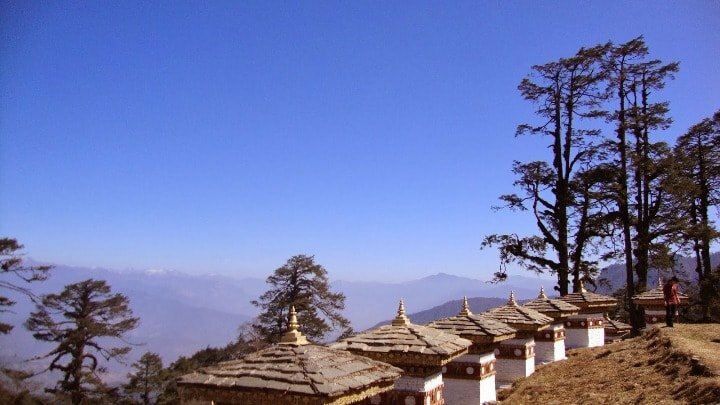 I am planning a trip to Bhutan this year and this post helped me a lot. Sinjana, how was the trek to Tiger’s Nest? Tiring? Hi Anwesha, I was almost y6 years younger then and it was not very tiring then :D. I actually loved the trek and but it is a full day trip. After the trek there’s only one or two additional places you might be able to see. I have always wanted to go to Bhutan. Thanks for the inspiration! 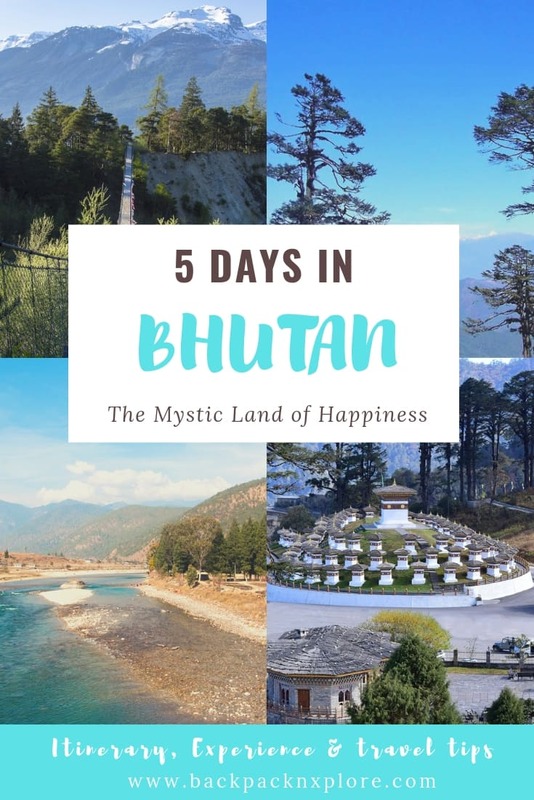 5 wonderful days in Bhutan, I want to do something similar to this. Such ready made itineraries are a big help. Trekking to Tiger’s nest is one of my goals there. And also hog on some the delicious cuisine there. Thanks Indrani. Hope you visit Bhutan soon. What an amazing trip. I’ve wanted to go to Bhutan for ever…my dad visited a couple of times in the 1970s when it was virtually impossible for a foreigner to enter and I’ve been fascinated ever since. Thanks for sharing this with us. Wow that’s so interesting. Hope you get to visit Bhutan soon. What a wonderful trek in Bhutan! I hope I am able to visit one day. Thank you for sharing your adventure. This was a recap to my Bhutan trip from last year. I went for 9 days and was able to see the beautiful Phobjika Valley and Bomthang as well. Thanks for the nice post. I enjoyed reading this post. I visited Bhutan a couple of years ago and loved every bit. The culture, the people we met and the food we ate. I loved the trek up to Tigers Nest. Sounds like you had an amazing experience in Bhutan as well. You’re so right about the Douchoula Pass, what a stunning view of the Himalayan range. I know little about Bhutan but feel more informed after reading this. Thank you also for the explanation of the dzouza, now I know what it is! haha. That’s a good thing that atleast there’s a country where others need visa and quite expensive one at that while Indians need nothing. Bhutan has done an exemplary job at preserving their forests which is why they are carbon negative. I’ve always wanted to trek to the Tiger’s Nest but there just so much more to see. I love the high mountain valleys and the happiness that’s everywhere. I also love that they are carbon negative, which is pretty darn cool. I’m planning to visit Bhutan by the end of this year, fingers crossed it happens soon. Loved your itinerary, you have included everything that I want to visit in this gorgeous country. Tiger’s Nest definitely tops my must visit list, a hike up would be a dream come true. Wow, it looks like you accomplished a lot on your girls’ trip! I’ve wanted to visit Bhutan for quite a while, and your story makes me want to go more. I can see now why they are referred to as the happiest nation on earth. Thank you for sharing!